deColourant is a ready-to-use printing paste for removing areas of colour from dyed natural fabrics such as cotton, linen, silk and wool. 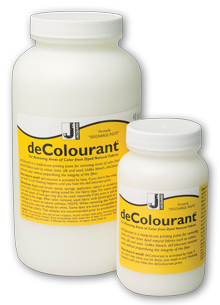 Unlike bleach, deColourant removes colour without harming the fibre. Apply with a brush, stamp, sponge, applicator, stencil or screen print. Allow to dry, then iron on highest setting suited for the fabric type. For extra colour removal iron with steam. A heat gun may also be used, especially if the print is still damp. After colour removal, wash fabric with Synthrapol or a mild detergent to return to natural softness.